At Camping Village Capo Vieste you can choose among mobile homes, bungalows, brick built cottages or wooden chalets, but whatever your preference, you can be certain that your accommodation will be comfortable and functional. Find your ideal among the following types of accommodation. A holiday at Villaggio Camping Capo Vieste will show you the real Gargano National Park. 8 km from enchanting Vieste with its historic centre, narrow streets and lively nightlife, from here it is easy to reach the fascinating attractions of this land. A short walk from the holiday village is the Paleo-Christian Necropolis “Salata”, dating back to III-IV centuries AC. Just 20km away is the pearl of the Gargano: Peschici with little white houses perched on a cliff. 16km separates the holiday village from the majestic and imposing woodlands of the Foresta Umbra and a little further afield are to be found the religious and spiritual destinations of Monte Sant’Angelo and San Giovanni Rotondo. BY AIR: Bari Airport (185km), Pescara Airport (230km). Arrival: The Structures are delivered from 17:00 to 20:00. A non-transferable third party pass (card and bracelet) will be issued, which will have to be carried with you, if it is a card or worn on a bracelet, for the duration of your stay. In case of denial you will not be able to access the campsite and formalize the check-in. The card and bracelet must be returned at departure. Departure: The facilities must be vacated from 08:00 to 10:00. It is not permitted to occupy the accommodation beyond 10:00 on the day of departure. Any early arrivals or departures are to be agreed with the Village Management. Cancellation / Advance Payment: Reservation is made with 30% deposit and balance at check-in. Booking can be canceled free of charge up to 30 days before arrival. To check the conditions of the chosen accommodation, just enter your arrival and departure dates in the "Booking Online" system and you will be able to consult both the cost of your stay and the booking and cancellation policy. Children and extra beds: Bungalows / Apartments / Mobile Homes can not be occupied by a number of people above those listed next to the typology. In no case will be allowed to accommodate persons other than the number indicated in the description of the booked Type. Any type of extra bed or baby cot is available on request and subject to payment upon confirmation by the Management. Baby Cot or additional bed at 10,00 Euro per day. 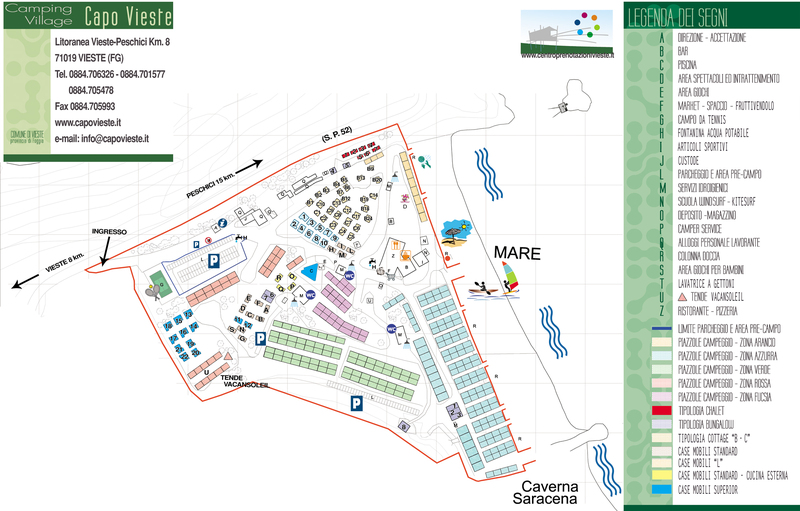 Differentiated Collection: Inside the Cape Vieste Village, ecological islands have been set up for the collection of paper, glass, plastic and moisture. Customers are asked to use them correctly. Accepted credit cards: American Express, Visa, Euro / Mastercard, Diners Club, Maestro, CartaSi, Bancomat. C / c checks are not accepted. Tourist tax: It is a municipal tax (obligatory) to be paid locally. For People per night for up to 10 nights, free Children under the age of 14 and Disabled with their escorts. Included in the price: VAT, water, electricity, gas, parking for a car, pool entrance, animation from early June to the first week of September, free Wi-Fi available in public areas (Restaurant Area). Private beach: The service, available at an extra charge of 16 Euro per day, includes an umbrella + 2 sun loungers. You do not book the Row, the assignment takes place on arrival and is subject to availability. Supplement First Row 6,00 Euro per day. Final Housing Cleaning: Service is not included in the price. It is available at € 40.00 for one-room and two-room apartments and € 50.00 for three-room apartments. At the start let the bungalow clean and defrost the fridge. Bedding: Service is not included in the price. It is possible to rent the bed linen at a cost of € 2,00 per day per person. Bath towels: The service is not included in the price. It is possible to rent a bath towel at € 2,00 per day per person. Parking: One parking place included in the cost of the stay. For a second car seat the cost is € 5.00 per day. 2) Cancellations or waivers notices will only be considered if made by registered mail or by e-mail. 3) If the cancellation will be made to the Village 30 days. before the beginning of the booked period, the customer will be repaid the deposit already paid. If the cancellation is made up to 15 days before arrival, the deposit is deducted but can be used for a stay in the following year. If the cancellation occurs within the last 14 days the entire paid deposit is retained. In case of no deposit within 7 days from the date of booking, the same will be deemed null. 4) In the event of a reduction in the booked period, no refund is granted for late arrival or early departure, whatever the cause. 1) The bungalow is delivered at 5 pm on the day of arrival and must be vacated no later than 10 am on the day of departure. -Customers who want to leave first have to agree with the direction of the way to start. -Clear the bungalow and store cash and / or valuables inside the safe of which all bungalows are provided and however valuables or valuables must be declared at Check-in at Reception staff. Guests of the campsite staying in Tents / Caravans / Motorhomes are kindly requested to contact the Management for any deposits. The Management does not in any case respond to any damages and / or theft or even damage to any kind of car or boat. -Do not damage the plants and what is provided to each Bungalow, the Management reserves the right to demand payment of damages; leave the bungalow clean (dishes and cookware washed) and disconnect or defrost the fridge at the time of departure. - Visits of friends and / or relatives are not allowed during July and August.